Maca, a root vegetable, is an ancient superfood of the Incas rich in calcium, potassium, iron, essential fatty acids, and protein. Purified and sterilized with Steam and Vacuum – a 100% natural method of removing pathogens and reducing germ charge in natural products. Used with our Premium Maca, this unique and efficient solution is able to provide us with the purest Maca product in the world. 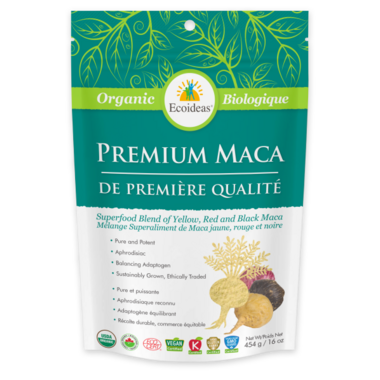 Maca is a nutritionally dense perennial tuber that absorbs and stores nutrients. Maca is native to the Peruvian Andes and belongs to the cruciferous vegetable family. It is typically grown as a root vegetable in harsh weather conditions and high altitudes. Maca is sometimes referred to as “Peruvian ginseng” and was highly revered by the Inca for its wonderfully rich nutritional properties. Maca is an adaptogen, known for its ability to increase energy, build physical strength, improve mood, reduce anxiety and heighten libido. It is rich in essential minerals, EFAs, amino acids and polysaccharides. Maca root contains over 55 naturally occurring, beneficial phyto-chemicals that work in tandem with the body’s natural rhythms. Maca root helps rebuild weak immune systems, re-mineralize poorly nourished bodies and increase energy and endurance. Haven't added this in my smoothies or anything yet but I did open the bag. It has a nutty/butterscotch-y smell which is different. I can't wait to try!